Property Size 3,411 sq. ft.
Come experience what this luxurious villa has to offer for you & your family. Stunning design and plenty of space to enjoy gathering together while still offering everyone the privacy they crave - even while on vacation! The pool area is a favorite with a gorgeous pool & spa. Take a day away from the parks to truly enjoy the Florida lifestyle while staying in this impressive vacation home at a gated community! Solterra Resort is a destination resort home community near Orlando, Florida. 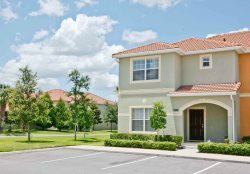 With proximity to Orlando`s world-famous attractions, exceptional shopping centers, easy access to I-4 and in the vicinity of clear lakes and top notch golf courses, Solterra is an ideal location where you can have it all! An elaborate, spacious 6,700 sqft clubhouse encompasses an internet room, fitness center and a large inviting gathering room. Moreover, it is equipped with many outdoor activities so you can have fun in the sun including a large pool with a waterfall and slide, a beach entry area, lazy river, picnic area, children`s playground and volleyball court. Property was great clean and beautiful.